Oracle is entering the virtual arena with its own Oracle VM hypervisor based on Xen called Oracle VM. The new product includes a web management console and will be released for free (with optional support agreements) on November 14. 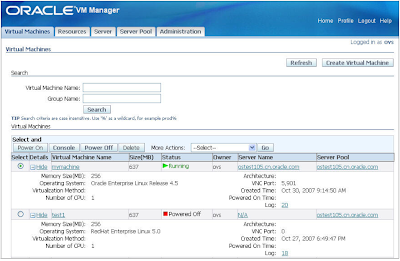 Oracle VM will available as a free download here Wednesday. What is Oracle thinking? I don't get it. Maybe it will be clear on Wednesday. Oracle VM is server virtualization software which fully supports both Oracle and non-Oracle applications, and is three times more efficient than other server virtualization products. Backed by Oracle's world-class support organization, customers now have a single point of enterprise-class support for their entire virtualization environments, including the Linux operating system, Oracle Database, Fusion Middleware, and Application software—all of which are supported with Oracle VM.